I love memoirs. For me they are a peek into the way of life during a time period in which I did not live. E.E. 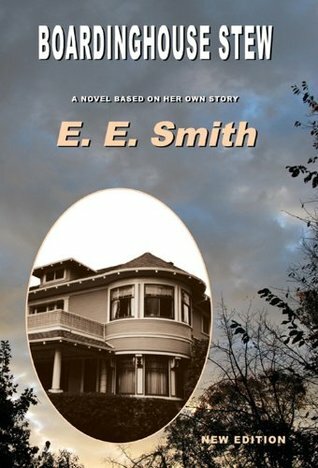 Smith has taken her memories and fictionalized them by changing the names of those involved. What comes out is a look at life, hers in particular, sprinkled with lots of humor. During World War II many women worked in the munitions factories. Food was rationed and life was difficult. Eileen, an eleven year old didn’t want to work in the fields so she lied about her age, saying she was thirteen, in hopes of being hired as a cook and maid in a boarding house. This would be a daunting job for an adult, but because of Eileen’s age the book is fun to read. This is not just a book about Eileen. This book is about all of the people who live at the boarding house and how they interact with each other. For me personally, a book that can touch my memories and emotions is a great book. Having said that, I will have to admit this was a great book. I found myself so irritated that the gardener, like so many other Japanese was placed in an internment camp. The reactions toward him were appalling to me. I loved how caring the doctor was. Mrs. Mumsford is a personality I could not nail down. I found her quirky habit of setting a place at the table for her deceased husband, and talking to his picture quite humorous, but at the same time it was sad. It was a reminder for me that she was having trouble moving on. For anyone familiar with stories of that time you will recognize several things that indicate what the time period was like. There were ration books, which made feeding so many very difficult. It also meant when a recipe went really wrong, you ate it anyway. We see people creating victory gardens which helped provide food when there was such a shortage. I couldn’t imagine the blackout curtains and the air raid drills. Eileen had to grow up so fast. Growing up on a farm in the sixties I could relate to the amount of work that was required of me compared to my cousins who lived in town. I would not trade that for anything. This was originally written as a play. I believe I would have enjoyed it no matter how it was written. The author took things a step further by including pictures that really help with the visualization of that time period. The title was very fitting for the book. The mixture of different people, their beliefs, jobs, habits and political ideas all mixed together the same way a cook would mix different ingredients to form a stew. Each character added their own “flavor” to the book. What came from this was a great dish worth reading. The year was 1943, midway through World War II, when no oe kew what would happen next. Two years later, the times are even less predictable for the young heroine of Times Like These, on her way to a new home and an uncertain future with her volatile parents. The war rages on in the Pacific, amid heavy casualties. Harry Truman is now president and secretly cosidering the use of a horrific new weapon to foce Japan to surrender. What would happen next?